My mother and father met in New York City, where they both worked at the time. My mother got pregnant with me in the hopes that it would induce my father to fall in love with her. Her somewhat flawed logic was that he would love the baby so much, that he would love her too. My mother apparently had many interesting ideas when it came to relationships. There is a story that once, during that time of the month, she arranged to get blood on the sheets of my bachelor father’s bed, so that his then-girlfriend would find it. In any event, her plan half-worked: my father did love the baby so much. And so he did “the right thing”: he married my mother. However, it didn’t last long, much, I am sure, to no-one’s surprise except, perhaps, my mother’s. When I was about three years old, my mother dropped me off for a visit at my father’s parents’ house. Well, it was supposed to be a visit – but she never came back for me. It turns out that my mother apparently also had many interesting ideas when it came to child-rearing, predominant among them that it wasn’t really for her. She should have already figured this out before having me (and indeed, perhaps she had), as it also turns out that not only was my father not her first husband, but I was not, by a long shot, her first child. She had dumped the three children that she had with her previous husband on her own mother, and they were now all being raised by their father. There was also rumour of a child she’d had at 16, and put up for adoption, although I have no idea if that was true. My grandparents lived in Yorktown Heights, a suburb of New York City an hour or so north of the city. I stayed at their house for a while, but eventually, and when it had become clear that my mother wasn’t coming back for me – ever, my father came to collect me as, while he didn’t much want my mother, he did very much want me. Not that he didn’t have his misgivings, chief among them being that he was a single man, with a pronounced drinking problem, living in a basement “apartment” (and I use the term loosely) in a part of New York City affectionately known as Hell’s Kitchen, for good reason. Now, by all accounts these days, Hell’s Kitchen has mutated into a lovely, upscale, clean neighborhood. But back in the early 60s, it certainly earned its moniker, being mere blocks from both Times Square and 42nd street. 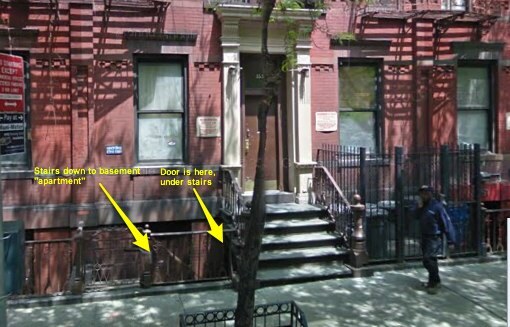 The “apartment” in which we lived was in the basement of a small apartment tenement on West 45th Street, between 8th and 9th avenues. To get to this basement you had to go down a flight of stairs that led from the sidewalk down to the basement door. The basement had been divided so that as you walked into the basement, one area to the right of the door had been walled off into a section that I would guess was about 10 feet deep, by 40 feet or so long. This was the “apartment”. At the very front of it there was a window that allowed some small amount of light in, and through which you could look up and see the feet of passersby. In the front section, where the window with the street view was, was where my father slept, and worked. My father worked as a translator of Russian technical journals, and so was able to work from home – or, really from anywhere, so long as he had with him a journal to translate, and a tape recorder into which to dictate his translation. In the middle section there was a utility sink. My father had a hot plate set up on the work bench that was next to the sink, and that was our kitchen. In the back section was a bed, and there was a curtain that could be drawn across to cut off the bed from the rest of the apartment, and that was where I slept. We did not have a bathroom, but there was a toilet in the way back of the basement that we could use. It flushed up, which was pretty interesting to me, but it was dark and scary back there. And of course, the whole thing smelled like, well, a basement. To this day, that smell of basement is very evocative for me. Two of my earliest memories of that basement apartment are that, my father having little in the way of accessories for a small girl at first, I wore a t-shirt of my father’s as a nightgown, and that I had a painting I had painted with finger paints hanging above the bed, and I tried to clean it with a wet rag and, well, you can guess what happened with that water soluble paint. It gives me shivers now to realize that I was walking around this neighborhood by myself from the time that I was six-years old or so. Before that, my father took me nearly everywhere with him – including into the neighborhood bars which he frequented. 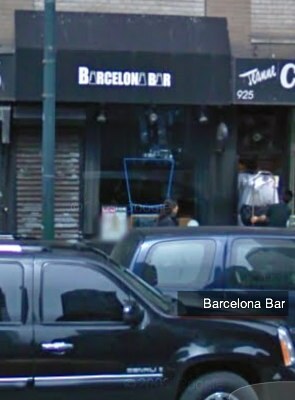 His favorite was “The Barcelona”, and you could often find me there, playing the juke box, and being the darling of the regulars. This is the intersection of w. 45th Street and 8th Avenue, my old stomping grounds. It looks much the same to me now as it did back then. 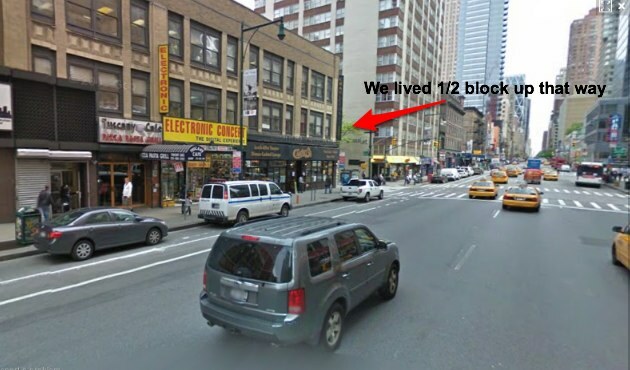 We lived one-half block up 45th Street. The interesting thing about children is that they don’t come with any preconceived notions about “how childhood should be.” This was just how things were, and it never occurred to me to think that most children didn’t live in a basement, or go to bars with their father. In fact, it wasn’t until years later, when a group of people at that time unknown to me threatened to sue my father for custody of me if he didn’t send me to a particular boarding school of their choosing, that I realized that not everyone thought my childhood was anything less than idyllic. But I’m getting ahead of myself, as that was after our moving to Vermont, our living in a condemned house, and my striking out on my own at 11. For now, our heroine is very happy living in a basement with her doting, if somewhat unorthodox, father. do you remember bill graham, the sheriff of windham county, who lived in putney? he passed on a couple of days ago at age 78. there’s an obituary in the online edition of the brattleboro reformer. Dennis – how old was I in which picture? Gunner – I don’t know that I do recall Sheriff Graham, although the name is familiar.